Star and creator: Lead actress Kristina Vuletic (left) and co-writer, producer, director Emilija Gašić of Некрштени дани (The Cursed Days) (2014) at their film premiere in Vancity Theatre, Vancouver, March 11, 2016. Picture: Erin Chapman. 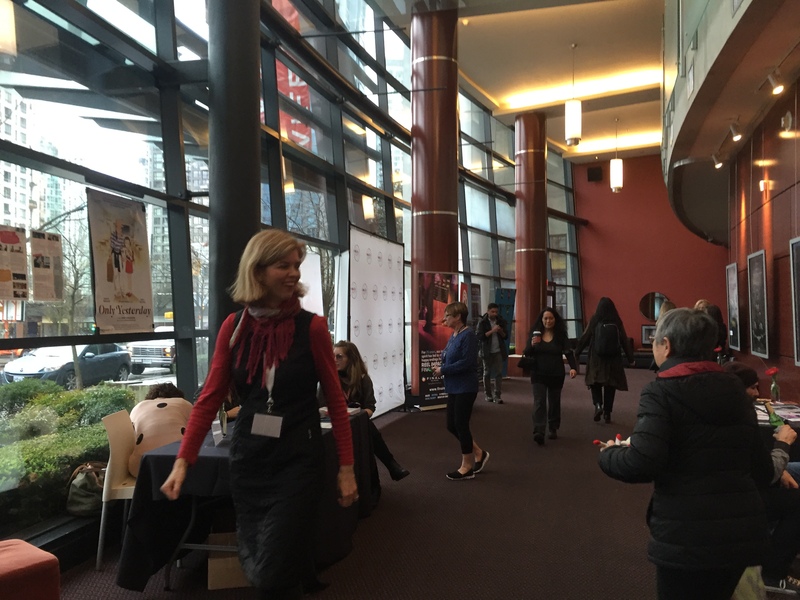 On March 11, 2016 I attended the Vancouver International Women in Film Festival at the Vancity Theatre in Vancouver for “70% Dark,” a collection of short films. Through a Facebook introduction made by James Lyon, author of Kiss of the Butterfly (2011), I had made prior arrangements for a press pass with Emilija Gašić, the writer, director and producer of Некрштени дани (The Cursed Days) (2014), a short Serbian film about vampires that was being screened that night. I met Emilija and Kristina Vuletic, the leading actress from the film, in front of the theatre before the show. They had flown in from Belgrade the day before. We spoke for a few minutes before a woman emerged from the lobby and told everyone to take their seats because the show was sold out and about to begin. Once in the venue, I felt a little relieved. I had no idea what to wear to the festival or what was acceptable. I settled on my preferred dress code of jeans, hoodie and sneakers. A few people were dressed to the nines, but most were sporting causal attire. Vancity Theatre: Inside the theatre, it wasn’t that crowded. A few film makers had tables set up with pamphlets. Picture: Erin Chapman. Beside the theatre entrance was a concession stand, where I noticed a huge line of people eagerly waiting to buy wine. It reminded me of line I saw at the Anne Rice reading I attended in 2013. Definitely more fancy than the movie theatres I am used to. I sat down in the front row: this way I had a good view of the Q&A panel after the film and being short of stature, it ensured no one would block my view. I struggled to take notes in the dark and after a few minutes I realized it was pointless. I decided to kick back and just enjoy the films. I won’t go into all the films, just a few that resonated with me. Beware spoilers ahead! Chaos Management (2015) was only a few minutes long. It focused on an assassin, who was annoyed by a crow outside her window. Instead of scaring the bird away like most people, she skillfully threw a knife, Jason Bourne style, instantly killing it before returning back to bed for a lay in. To me, the next film didn’t fit the bill being included in the dark horror theme. It was more comedic than scary, but it was entertaining. Shear the Sheep (2015) was not about grooming farm animals. The authorities were on the hunt for a woman that drugged men with beards and after they passed out, she would give them a clean shave with a side of trauma. They took the premise of a serial killer and played on the lumberjack facial hair trend. When I saw a hot model on a photo shoot in the ocean get bitten, right away my thoughts went to “mermaid” and I was right. Seirēn (2015) depicts her transformation, but not into Disney’s the Little Mermaid we all know and love—her infection was more like something from Alien. Her diet took a rapid turn for the worst when she ate her cat’s food and demolished a tray of sashimi at a restaurant accompanied by numerous glasses of salt water. She tries to eat her friend too. In Pequeño (2014), a little girl spent all her time alone wandering the woods collecting bugs and keeping them in jars. You saw no family members or friends; I guess you could say the bugs were her only interaction. The camera angles showed what the bugs would see looking out of the jars and the constant buzzing was just creepy. After many sleepless nights, the film hinted the girl turned into a bug herself. This eerie black and white film reminded me of The Fly (1986). Kristina played Stanika, a young woman with two different eye colours who was shunned and treated as second class by her family due to her physical difference. During dinner her father, Dušan (Vojin Cetkovic), said her older brother Strahinja (Andrija Danicic) and him were leaving to fight the Turks the next morning. He instructed the family not to speak their names for at least ten days, otherwise they would turn into vampires. Milica (Natasa Ninkovic), the mother, Stanika and her youngest brother, Vuk (Nemanja Pavlović) went about their daily lives until many days later, when Strahinja randomly shows up. Excited, Vuk asked where was his father. Everyone got upset with him due to the superstitious rule about mentioning their names. His father returned during dinner that night, and it was apparent no one was happy to see him except Vuk. Later that night, Strahinja woke Stanika up and told her to run. She takes off and you hear her father attacking everyone. I liked how this film took the premise of a myth and applied it to a real life situation with a family. It was also interesting to get a glimpse into what family life was like in Serbia back in the day. The film wasn’t full of gore and blood like some recent vampire flicks, but the filming and storyline added suspense, which I enjoyed. After the films concluded, a Q&A panel was held in the theatre with members from each film. 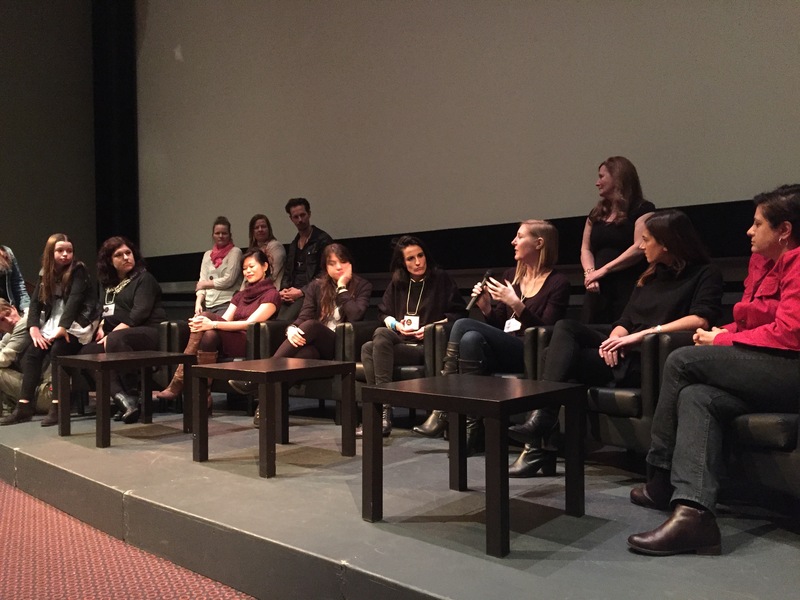 From far and abroad: A mix of local and international film makers take the stage; some ventured to Vancouver from as far as Spain and Belgrade. Emilija Gašić is seated, center, resting her head on her hand. Picture: Erin Chapman. Due to a lack of questions from audience members, the host ran through some basic questions like what inspired their films and what projects they had coming up next. My story was inspired mostly by this incident that I read in this encyclopedia. It was this story in this village in Serbia where people gathered round and exhumed bodies of people they believed were vampires in the 1800s. And then the Hungarians were intrigued by this and they sent like a regiment of soldiers to see what was going on and wrote about each body they found. Specific stuff because they didn’t really look like they were decomposing. They really believed that they were vampires. Well, today I think this is medically explained, but at the time people really really thought vampires existed. And then the story that I previously mentioned, along with a Russian novel that I read while I was still in high school. I merged all three into one and made this film. I was also impressed by the authenticity of the old house they used and wanted to know more about it. Home renovations: The house was a definite fixer upper. Stanica (Kristina Vuletic) and Vuk (Nemanja Pavlović) in a scene from The Cursed Days (2014). Picture: Emilija Gašić, Dusan Djokovic/Vimeo. It was a friend of my production designer’s friend, a friend of a friend of a friend kind of story. They told us there is a certain house that might suit us. We went there with this guy, and he was our guide and the house was pretty much like you saw it. It was in very bad shape inside. We rebuilt the floor. We did all that so we can shoot inside and outside. A lot of people in those areas had their houses flooded and stuff. It was immediately before we were shooting, like a week before. I was worried if we were going to shoot on those days because the areas around in Belgrade used to be marshes and stuff and now they are cities and stuff. So whenever it rains, it is easily flooded. A lot of people lost their houses that May 2014. 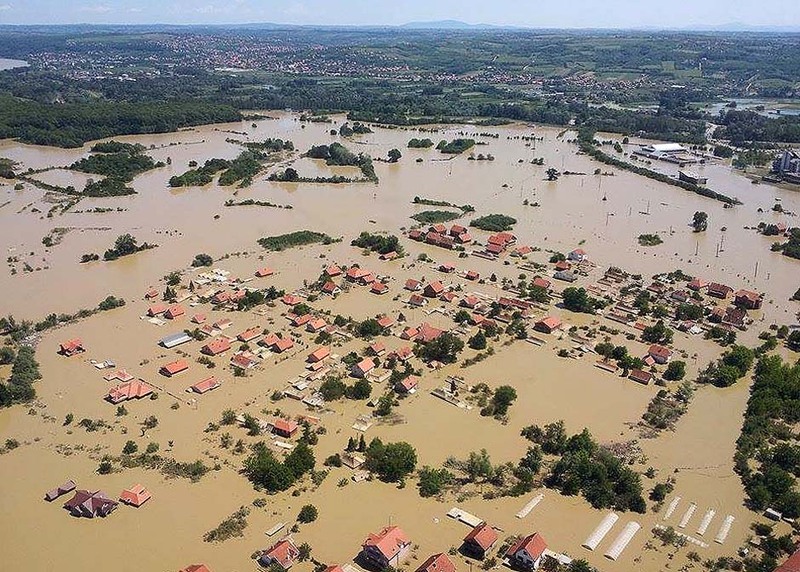 This is how bad it got: Rogača, a film location used for The Cursed Days, suffered from severe flooding during extreme weather conditions between May 13–18, 2014. Picture: Mondo Portal. It depends on area that you live in, but generally if you are from a small town like we are, like small or like even a village will more likely hear scary stories. Not necessarily about vampires, but about other mythological beings. There are like I wouldn’t know how to translate their names now ’cause there are only a few books in Serbian about these kind of things so I wouldn’t know the names in English. “Screamer” would be one. It’s like this creature that screams at night. The literal translation is screamer, but its a very archaic word for screams. It’s more eerie when you hear it in Serbian. My grandfather used to scare me about telling me stories about this particular creature that also drinks blood, but it’s not a vampire, a sub-vampire. I think people in bigger cities, they are, I don’t know, prone to different customs and superstitions. Like don’t do this because this will happen. I don’t know what because there are certain rituals and stuff like that. But in the smaller places, like my grandparents from my mother’s side are even from a smaller village. Like they have more stories. I used to go there and listen to the different scary stories they would tell me that either concerned vampires or just bad people who died became ghosts sort of. I think it’s a mix, I don’t believe in vampires […] When we talk Serbian mythology, specifically because there is a lot of different stuff Serbs don’t know because they don’t study about it. There’s like little source, none at some point. Only now they started publishing books about these kind of things. I am hoping that more people will learn about it. I think it depends really on the area where you are from. There are different customs and different superstitions and different stories. There are customs that people still do today at a funeral, but they don’t know why you do that. Like you have to when you bury somebody, you have to go back to their grave like a general meeting with a priest 40 days after. And then I read it somewhere in this Serbian mythology book that I recently ran into, I read it because you are afraid that this person is going to become a vampire. So you have to pay your respects 40 days after and you can’t let anyone jump over the grave in those 40 days. Or when someone is being buried you can’t let anyone or animal jump over the grave. That’s like a bad omen. This person will definitely be a vampire so you have to do all these different customs in order not to make a vampire. It’s also funny when you compare the customs or the myth and movies today how they represent vampires. I think it was Anthony [Hogg] I was talking to and all the stories he read and they are from Serbia. There are no fangs, they never mention huge fangs that somebody has. The only mention were like description of a vampire is a tall, dark person with a lot of like dark circles around his eyes. Like tired sort of and a little bit of reddish eyes and like chubby sort of. Yeah not so fat, you know its like because you bury somebody and they bloat. I think that’s a better word for it. So that is the only description you can find. You can’t kill them with any stake, it has to be a hawthorn stake. I don’t know why, I think it’s because it is very hard or tough. But generally in Serbia everybody knows you have to do this, but it’s like something everyone knows. Like if you ask a person on the street they will tell you hawthorn tree. After about an hour we wrapped up our conversation. That night proved to be great fun: I attended my first film festival, made a network connection from the other side of the world and was able to sit down with a director from Serbia, the heartland of vampire folklore. Seeing a bunch of short films was a definite change of pace as opposed to my usual choice of a feature film. It was great to see all the faces behind the productions on stage, talking about their passions and inspirations. I loved how this entire excursion was possible because of a friend we made through Facebook. The best part was the event was right in my own backyard. Vampire fans make sure to keep your eyes open, you never know what fangtastic treat will fly into your city next. 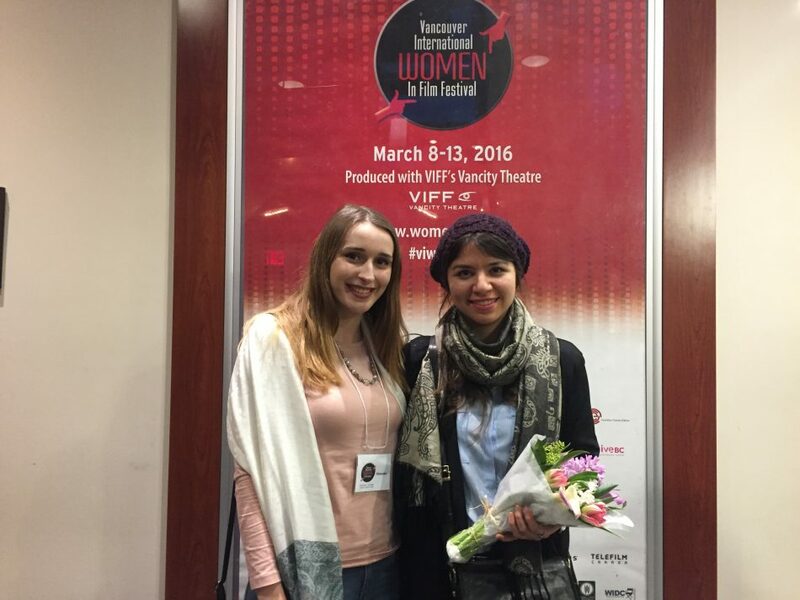 a short Serbian film about vampires: Women in film & Television Vancouver, “2016 Film Festival – Films,” Women in Film + Television Vancouver, 2016, accessed May 2, 2016, http://www.womeninfilm.ca/cgi/page.cgi/VIWIFF_2016_Films.html?_cms=2#Cursed. archive.is link: http://archive.is/92rh0. the Anne Rice reading I attended in 2013: Erin Chapman, “The Day I Met Anne Rice,” Vamped, Jan. 7, 2014, accessed June 20, 2016, http://vamped.org/2014/01/07/the-day-i-met-anne-rice/. “It was a friend of my production designer’s friend”: Emilija Gašić, interview with the author, March 11, 2016. Subsequent block quotes are taken from this interview, except where noted. “Well, in Serbian the title is not quite the same”: Emilija Gašić, Facebook message, June 1, 2016. You can “like” the film’s Facebook page, follow it on Twitter, or visit Emilija’s website: http://emilijagasic.com/.